L to R: Sean Larkin of Revival, Jen Brinton of Grey Sail, Nick Garrison of Foolproof and Brent Ryan of Newport Storm. Sean Larkin sits at the bar of the newly opened Brutopia Brewery and Kitchen just a few hours before the afternoon and early evening crowds start pouring in. Brutopia is Cranston’s first brewpub and the latest beer-related project involving Larkin, who began his beer-drenched odyssey twenty years ago. Since then, his involvement with beer has changed and so has the overall culture of beer in Rhode Island. Larkin, who works at Brutopia as a consultant, is a big man with an equally formidable knowledge of beer. While at the bar, a fellow brewer tending the equipment explains to Larkin his next moves, seeking approval to move ahead. This is the kind of reputation Larkin has achieved starting with his work at Trinity, which led to later endeavors. “I ran Trinity Brewhouse in a capacity where, after a year of apprenticing, I became head brewer, and opportunities that arose in the Rhode Island beer market were things that I capitalized on,” Larkin says. These opportunities included consulting for Narragansett Beer and his current gig at Brutopia. Narragansett first sought Larkin in 2006 to create beers to add to its base products, its lager and light lager. “In that respect, that sort of kick started the publicity around my name, meaning that they did a bunch of PR to promote their company and, in turn, the PR was positive for me,” Larkin says. “Positive for me in the sense that if the beers did really well, which they did, then my name was in the paper and there was a lot of fanfare about it.” Larkin has written the recipes for Narragansett specialty beers including the Bock, Summer Ale and the wildly popular Autocrat Coffee Milk Stout and Del’s Shandy. 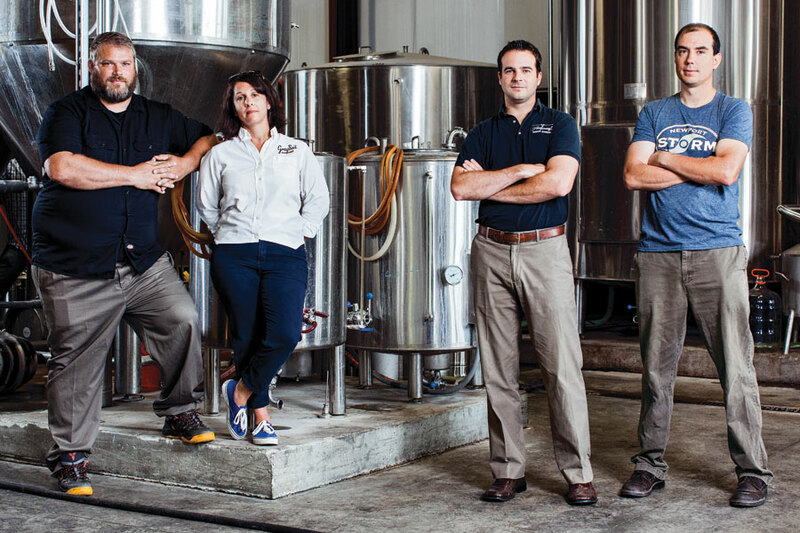 While Larkin was still an employee at both Trinity and Narragansett, there was no opportunity for equity at either company, which ultimately led to the opening of Revival Brewing Company as a brand, in 2010 by Larkin and two partners. With Revival, Larkin went into beer making with the philosophy that there’s a different beer for different people. He’s not interested in trying to convince a drinker to like a certain type of beer. If one demo doesn’t like it, there’s another that will. When Larkin started Revival, the beer landscape in Rhode Island was still fairly thin. In the last two years, the state has seen the openings of Ravenous Brewing Company, Foolproof, Bucket Brewery, Whaler’s Brewing Company, Crooked Current Brewery and Proclamation Ale Company. This growth was preceded by the opening of Grey Sail in Westerly in 2012, which was started by Jen Brinton, a wedding planner, mother of four and wife of an avid beer lover and former home brewer. About a year after Grey Sail, Foolproof Brewing Company opened its doors in Pawtucket. After less than a year of home brewing, founder Nick Garrison brewed the beer for his wedding in 2008. While visiting a brewpub on their honeymoon, his wife mused, “Wouldn’t it be cool to open a place like this?” Garrison says that was the moment he knew he’d open a brewery. 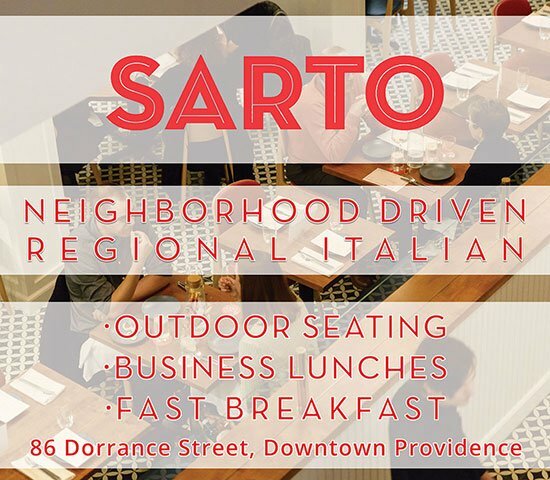 Garrison chose to open in Rhode Island because he loved the state and also because he realized it was an underserved market. Ryan says the recent success of Rhode Island craft beer is due to a growing national interest. Ryan and three friends from Colby College started Newport Storm after graduating because they loved making beer and because they noticed craft beer starting to take off in other parts of the country. “More people were getting into craft beer so we felt that, on some level, there were people in Rhode Island who were interested in getting a local Rhode Island beer on tap or buying a local Rhode Island beer at their local liquor store,” Ryan says. When Newport Storm began, Ryan says it was hard to promote Rhode Island beer because they were the only one. “It was very tough for us to create that sense of, ‘yeah, let’s drink Rhode Island beer,’ because it just came down to ‘yeah, let’s drink Newport Storm.’ ” Today, Ryan thinks the growth of local beer starts with the beer drinker. If more bars and restaurants start focusing on carrying local beers and clientele regularly frequent those businesses, then future bars and restaurants will start carrying more local beers, too. “Unfortunately for the Rhode Island brewers, we have not seen as dramatic a change in the amount of focus that the local brewers get as a portion of the total craft attention as other places have,” he says. Steve Sharp, brewer at Foolproof Brewery. According to the Beer Institute, a national organization that represents the beer industry, beer contributed to 3,430 jobs in Rhode Island in 2012 between brewing, distribution and retail. The Cranston-based distributor McLaughlin and Moran accounts for 120 of those jobs. The men and women behind the curtain take to the delivery trucks and make sure Rhode Island’s taps and store shelves are stocked. Though 97 percent of McLaughlin and Moran’s business is with Anheuser-Busch, its elevated spirits division is dedicated solely to selling high-end craft products. Their portfolio includes brands such as Wachusett and Heavy Seas, as well as Grey Sail and Revival. General manager and vice president Mark Wahlgren credits the business’s growth to Anheuser-Busch. The company was started in 1936 by first cousins John McLaughlin and John Moran in the basement of McLaughlin’s family home. In 1945, McLaughlin and Moran was selected to be the Rhode Island distributor for Anheuser-Busch. Over time, the company moved to Providence and eventually to its current 114,000-square-foot location in Cranston. They now have up to fifteen trucks running daily, delivering 15,000 to 24,000 cases of beer a day, and a little more than four million cases a year. Crushing blueberries at Newport Storm. Alan brinton of Grey Sail brings a new tank into the brewery in 2012. In addition to physical deliveries, distribution involves other logistics including receiving, warehousing, selling, marketing and administrative components such as paying taxes and collecting money. “The route to market for beer is a competitive environment that wholesalers have to navigate,” Wahlgren says. “Without our help in navigating, they never get to the consumer.” John Richard, a consultant at McLaughlin and Moran, is also the owner of the Avery, a popular bar in the West Side of Providence. He’s seen firsthand what can happen if a brewer hasn’t figured out distribution. “As a retailer you see people coming to you with product which is really good and you may not see them again because they haven’t figured out who their distributor is going to be, how it’s going to get to me,” Richard says. Meanwhile, more breweries continue to pop up. One of the newer breweries on the scene, Proclamation Ale Company, was started by Dave Witham, a former music teacher turned stay-at-home-dad turned brewer. Currently, the brewery offers Tendril, a beer in between an IPA and an imperial IPA, as its one draft account. Down a dirt road off of Route 2 in Exeter is Ocean State Hops and the future home of Tilted Barn Brewery. It’s here that Matt Richardson started farming hops to support his personal homebrewing during a worldwide hop shortage. After harvesting more hops than he could use, Richardson started selling his product to other brewers. Now he’s in the process of opening his own brewery. While new breweries continue to open, news about Narragansett Beer’s return has been quiet. The brewery, which prides itself on all things Rhode Island, still brews the bulk of its beer in Rochester, New York. When asked in July about opening a brewery in Rhode Island, CEO Mark Hellendrung said the company was sixty days from making an announcement, but that something would definitely happen before the end of this year. In Providence, Jeremy Duffy and Devin Kelly are working through the logistics of opening Isle Brewers Guild. The planned facility will be located in an 80,000-square-foot building in Providence and will have the capacity to brew up to 60,000 barrels a year. Isle Brewers will not be producing its own brand of beer. Rather, it’ll be a beer cooperative for smaller brewers who have a brand identity but might lack the equipment to produce larger volumes. Information about the contract brewery and its cooperative model has been scarce and Duffy declined to comment for this article. Larkin says Revival was approached to be part of the Isle consortium but it declined because the Isle Brewers business model did not fit with Revival’s future plans as a company.